Cornell University Honey Bee Extension Associate Emma Mullen inspects a hive in Northern NY. Photo: Mary Kate Wheeler. June 26, 2017. How healthy are the bees in Northern New York? The results of a first-ever survey to identify the presence of key parasites and pathogens in regional bee colonies are now posted at www.nnyagdev.org. The farmer-driven Northern New York Agricultural Development Program provided a small grant a survey of Northern New York bee colonies to contribute to regional knowledge and educate regional beekeepers on practices to better maintain the health of their bees and their businesses. 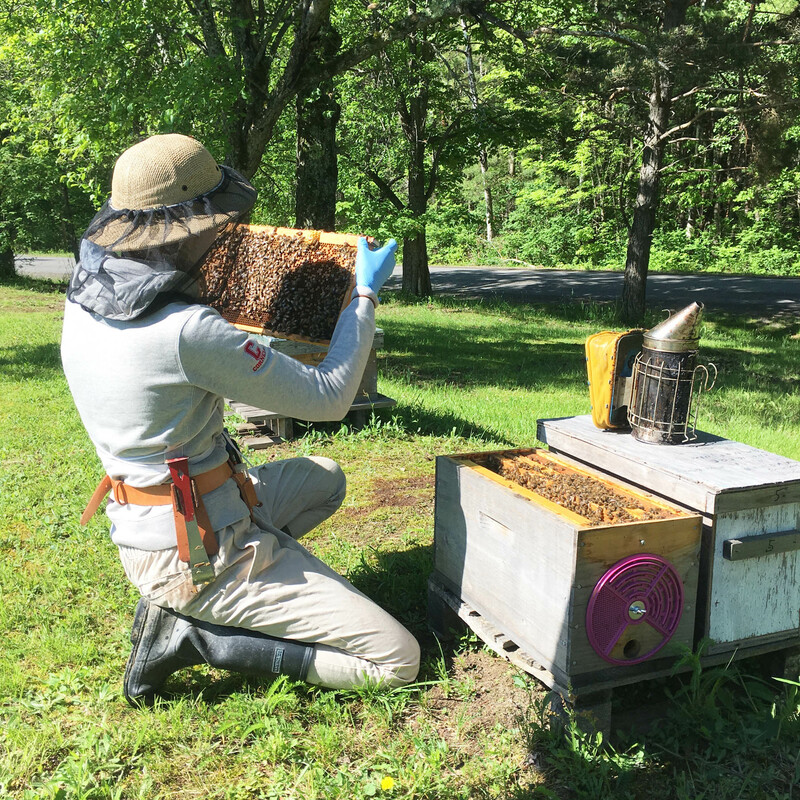 “This project documents for the first time the levels of key parasites and viruses in commercial and hobby bee colonies in Northern New York,” said project leader Emma Mullen, a Honey Bee Extension Associate with Cornell University, Ithaca, NY. The data on the levels of 8 viruses in the NNY bee colonies contributes to a statewide database on the factors influencing pollinator health and identifying current management practices by beekeepers.
. NNY bee colony winter losses of 21.3 percent, summer losses of 6.17 percent from October 2015 to September 16, 2016; the statewide average for that time was respectively 28 percent and 7 percent.
. Varroa mites, considered the most detrimental and widespread parasite of bee colonies, were significantly higher in bee colonies in NNY than in other regions of the state in 2016.
. Levels of Nosema, a parasitic fungal pathogen found in the bee digestive system, were significantly lower by 65-82 percent in bee colonies in NNY than in other regions of the state. The research continues in 2017 to determine the main predictors for colony loss. “Considerable evidence points to parasites and pathogens as a leading factor of bee colony loss and statewide beekeepers continued to experience unsustainable colony losses, averaging one-third of their operation in 2016, though less so in Northern New York,” Mullen said. The cost to replace a single colony of bees ranges between $100 and $200. Among the practices Cornell University and Cornell Cooperative Extension educators are encouraging beekeepers to pursue to encourage bee and colony health are detailed recordkeeping of colony observations and management, heightened monitoring for Varroa mites, and an Integrated Pest Management approach for disease and pest management. Seventy-three percent of beekeepers in NNY reported already keeping records of colony inspections of growth, health, and productivity. The average honey harvest by beekeepers in Northern NY is 46 lbs. of honey per hive. The 2016 Improving Beekeeping Management Practices to Increase Pollinator Health and Honey Production in Northern New York report, data tables, and a NNY Beekeeper Directory are posted under the Horticulture tab on this website. The farmer-driven Northern New York Agricultural Development Program provides research and technical assistance to the six northernmost counties of New York State: Clinton, Essex, Franklin, Jefferson, Lewis and St. Lawrence. Funding for the Northern New York Agricultural Development Program is supported by the New York State Senate and administered by the New York State Department of Agriculture and Markets. Event Notice: August 1, 2017, 6-8 pm, CCE Lewis County, Lowville: NNY bee health project leader Emma Mullen presents a bee health workshop on parasites, pathogens and pesticides in NYS. Cost: $5/person, pre-register by July 27 before 4 pm wth 315-376-5270.